Above the Fog from Jason Short on Vimeo. We'll be back at our regularily scheduled time next week. If people want to just hang out in the chat at 9PM on Sunday though, you're more than welcome. A routine mission to photograph NASA from our day job almost ended in tragedy as our XbeePRO 900's lost contact & the vehicle headed for a roof. The XbeePRO 900's sucked from day 1. The problem seems to be they only do 50mW compared to the 90mW of the original XBee PRO 2.4Ghz. They also spread the signal more omnidirectionally, making for all around weaker reception. Flight test programs at Edwards Air Force Base and NASA’s Dryden Flight Research Center usually are off-limits to outsiders, but we got a peek at one of its coolest programs, the X-48B, when the Air Force recently threw open the gates for an open house. Hobby King released a new platform which might address some of the complaints with easystar - it's larger, has ailerons (and flaps), and plenty of room under the wing for CG neutral payloads. I been thinking about create a simple and relative ground station to display information in a more useful way. -Simple reference map, with actual position, distance and heading of the airplane relative to home. -Display waypoints relative to home. -Display information more like an OSD. Developer ArduPilot 2.4 Officially Released! You can download ArduPilot 2.4 + Ground Station Beta 2 from here. -Altitude hold improved for my EasyStar. -Free running analogs for better performance. -Now compatible with ArduPilot Shield V2. 3D Robotics $1,500 for a RC stabilizer IMU! Sigh....I am going to give Peter Hollands an award for finding the "juiciest bug" in the released waypoint firmware for the UAV DevBoard. The bug has been fixed, and the firmware has been re-released as version 1.8b. I was wondering if anyone had done any work on orbiting or managing turns? I prototyped an idea I had last night about orbiting waypoints and realized the same algorithm works for turn prediction. We've wanted to be transparent with the community on our plans for ArduPilot Mega to get feedback, but I fear we've also introduced uncertainty and confusion. Here are some tips and pointers that may help you plan your ArduPilot path. First, congratualulations to Brian Wolfe, the winner of the second round of the T3 Contest. Now it's time for Round 3. 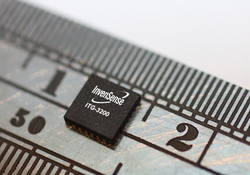 "World's First Single Chip 3-Axis Digital Gyroscope"
$3 in mass volume, so that has to mean under $20 single quantity. 16bit digital output using I2C Interface is nice, 16bit is a good start.